Abstract: AOpen's GeForceFX 5900XT packs in 128MB of DDR RAM, supports dual monitors, has TV-Out capabilities and comes with a bundled copy of PowerDVD 5. If you haven't already heard, GeForceFX 5900XT videocards are easily the best value cards on the market, beating anything ATi has to offer in the mainstream segment. Naturally, while manufacturers strive for market-driving performance, GPUs like the FX 5900XT are the bread and butter of the videocard industry. 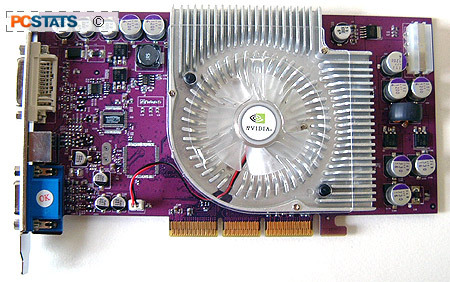 Nvidia being Nvidia, and ATI being ATI, the FX5900XT is the mainstream brother to the FX5900 Ultra. 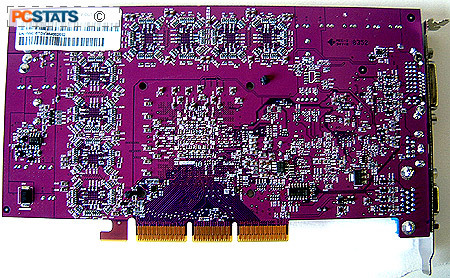 ATI followed suit, releasing the mainstream Radeon 9800 Pro, and then the high-end Radeon 9800XT videocard. So basically, both companies have adopted an XT moniker, except that nVidia use it with their mainstream parts, and ATI with their high end parts. All of this equals a very confusing situation for consumers. In this review, PCstats is going to cut through some of that confusion, and present you with the hard benchmarks for the Aopen FX5900XT videocard. AOpen's GeForceFX 5900XT packs in 128MB of DDR RAM, supports dual monitors, has TV-Out capabilities and comes with a bundled copy of PowerDVD 5. Factor in the $239 CDN ($175 US) price tag (which is one of the lowest priced FX 5900XT's we've seen), and pretty much everything else can be forgiven if the card does seem a little vanilla. Oh, did I happen to mention that AOpen boosted the default core clock speed from 390 MHz to 420 MHz too? In the long run I think end users will appreciate that little speed boost much more than any software package! 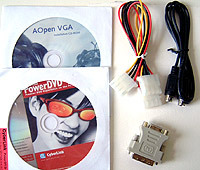 S-Video to S-Video cable, Molex Y Splitter Cable, DVI to analog converter, Power DVD 5, Driver CD. While the layout of the AOpen GeForceFX 5900XT looks like it's based on the nVidia reference design, the layout of the components are actually a bit different when compared to the Albatron GeForceFX 5900XTV or MSI GeForceFX 5900XT-VTD128 videocards. The AOpen GeForceFX 5900XT has one large aluminum heatsink to keep both the core and DDR memory running cool. Thermal paste was used between the GeForceFX 5900XT core and heatsink, and acoustically, the heatsink does not generate a lot of noise. AOpen clearly recommend users run the GeForceFX 5900XT in a PC with a 300W power supply. It also warns against potentially damaging the videocard because of AGP slots that do not meet AGP specifications with regards to the components that surround them (in other words, make sure the videocard is fully seated, and the retention lock engaged before turning on the power). Like all high powered videocards, the AOpen GeForceFX 5900XT requires its own molex power connector to fully function at maximum speed. One is included in the box. For those of you who like to connect the PC to the TV, AOpen's GeForceFX 5900XT does support TV-Output capabilities. They also include the necessary cables for you to take advantage of that feature which is nice. If you're into dual monitors, AOpen also bundles a DVI to analog converter so you can use two analog monitors at the same time. These days most manufacturers bundle fairly new games with their videocards so we were a bit disappointed to see none with the AOpen GeForceFX 5900XT. I guess the card's saving grace is that it's priced very aggressively and is one of the cheapest GeForceFX 5900XT's we've ever seen. That will certainly appeal to those of you on a budget, now you don't have to worry about buying something under powered! Pg 2. Overclocking the AOpen card!